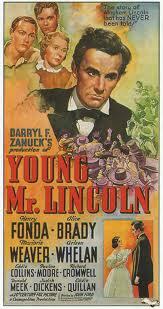 The poster provides an insight into the perspective that Ford's movie adopts towards Lincoln in his younger, pre-presidential days. Not only is he a muscular pioneer. He's also a thoughtful, contemplative man. This Lincoln also has an eye for the ladies. He's adaptable - a farmer in one frame, a courtroom lawyer in another, then a politician. 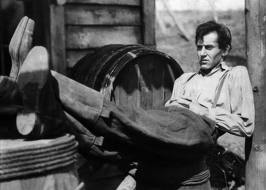 The genius of Henry Fonda's portrayal of the young Lincoln is that it reveals the different facets of Lincoln's personality, including his sense of humor, while also conveying a sense that the man is steadily growing in wisdom and integrity despite the domestic and personal difficulties with which he has to contend. 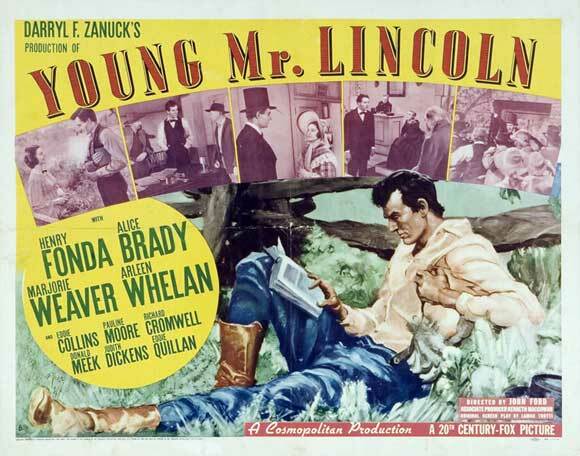 A modern advertisement for Young Mr. Lincoln, like the sepia-toned DVD cover above left, gives heavy prominence to its director, John Ford. But when the movie was released in 1939, posters emphasized its producer, Darryl F. Zanuck, and its cast. The posters also made much of the family and romantic aspect of this stage of Lincoln's life. The poster on the right shows a young Lincoln in workingman's garb, a man of the people. His determination is indication by his clenched fist. The central poster shows a Lincoln in more formal clothes, appropriate for a lawyer. In both posters he appears to be confronting a crowd. Why is Young Mr. Lincoln so important? Ford's 1939 movie is one of the essential works of art that mythologizes a vital part of American history. It's patriotic without being ponderous or too sentimental. It admires Lincoln and foreshadows his emerging greatness, yet it avoids the trap of placing him on a pedestal and making him remote and unreachable. Above all,Young Mr Lincoln presents the man as a fallible embodiment of the potentialities of American society. "Everyone knows that Lincoln is a great man," Ford said "but I wanted to show ...that even when young there was something great in him." 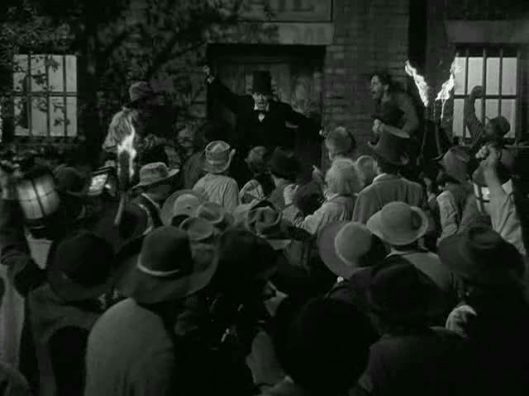 Although Ford is myth-making, he's not doing it pretentiously.He told Henry Fonda, initially reluctant to play the role, "This isn't 'The Great Emancipator,' for God's sake--it's a movie about this jackleg lawyer...." In this film we see Lincoln, once a store-keeper, then a country lawyer, unlucky in love, gradually revealing his potential to become a man of destiny. 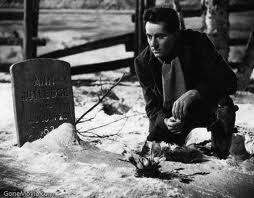 The French gave the movie a apt title - Va sa destinée (Towards His Destiny). One of the most welcome aspects of Ford's interpretation of Lincoln is that he provide him with a sense of humor, a quality almost entirely lacking in other cinematic/television portrayals of the man. Much of the credit for this must belong to Lamar Trotti's fine screenplay, which suits Ford's penchant for homespun comedy. Even in the crucial murder trial scene Lincoln's defense of his two clients is a mix of informal humor and impressive oratory. For most of the film this Lincoln is capable of self-mockery and humility. He's socially awkward, and he's certainly not the greatest lawyer, but he readily admits his faults. At the same time Lincoln is revealed as a fine orator and a man of reflection and increasing wisdom. He's also shown at ease with broad community hijinks, such as pie eating competitions, tugs of war and town drunks. the individual, but imposing obligations as well. In this film, the young Lincoln is helped by kind-hearted pioneering families,(one of whom gives him his first law books) and has to rely on local communities for employment and political support. Scenes of Lincoln alone, contemplating or reading, are counterpointed by the many scenes showing him talking to voters, Yet he has to resist the community when it turns into a vengeful mob. Ford and Trotti focus on the young Lincoln's stubborn insistence that for all his faults he can recognize what the morally right course of action is and he will take it against all odds. "I may not know much about the law, but I know what's right and what's wrong." Young romance: Lincoln as a rather awkward suitor. Whether or not Lincoln was in love with Ann Rutledge is dubious, but in the film her death is a key stage in the young Lincoln's outlook on life and loss. 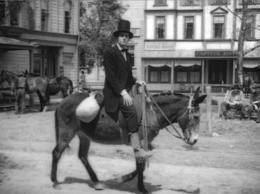 LIncoln arrives in Springfield, Illinois, riding a mule -nice religious symbolism here. John Ford, left, on set with Henry Fonda. The critic Richard Franklin maintains that the movies of John Ford make him "at the very least the US’s greatest historian (his films having examined virtually every era from the Revolutionary War to Vietnam)". 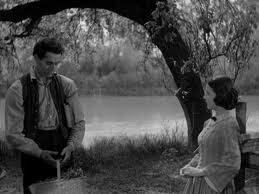 As with most Ford films that have a basis in history, Young Mr Lincoln transforms a basis of historical fact into mythology. Ford retains the essential details of Lincoln's formative years: his experiences as a shop-keeper, his struggle to learn the law, his campaigning for office. 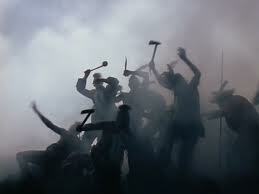 But several crucial even ts in the movie are of dubious historical authenticity, although they make for a great story. It is uncertain whether or not Lincoln courted Ann Rutledge or that her death of typhoid fever in 1835 plunged Lincoln into depression. There is little evidence for a pioneer family giving Lincoln his first law book as a payment for provisions. The vital court case so vividly depicted in the movie was based on an actual murder case that Lincoln defended, but in real life it did not involve the two brothers which the movie shows Lincoln saving from a lynching and then successfully defending in court. The trial - of one man, not two - occurred not in Springfield, Illinois, but in Beardstown in that state. 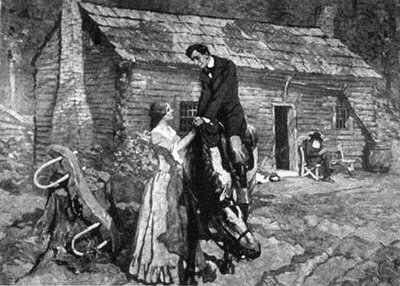 One of many popular illustrations depicting the alleged romance between Lincoln and Ann Rutledge. 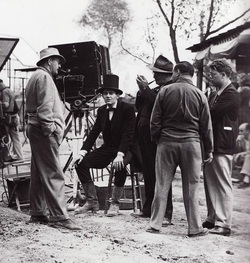 Ford's mythologizing genius - at the film's close, Lincoln strides away into future greatness amid the gathering clouds. LIncoln prevents a lynching: not history, but great drama. During an amazing twelve-month period in 1939-1940 Ford made not fewer than four masterpieces: Young Mr. Lincoln, Drums Along the Mohawk, Stagecoach and The Grapes of Wrath. No other director in cinematic history has ever remotely approached this astonishing burst of creativity. Although each is separated from its companions in terms of subject matter and setting, all four share one feature. Each is an examination of the importance of community / family as a factor that supports yet challenges the individual. The critic John Baxter believes that "a powerful sense of community" in a crucial element in Ford's movies. The two excerpts from the movie below reveal different forms of community spirit,and also provide insights into Lincoln's personality -courageous, witty, adaptable , easy-going when necessary - as interpreted by Ford. 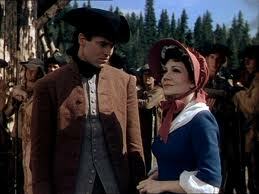 In "Drums Along the Mohawk", Henry Fonda and Claudette Colbert are part of an up-NewYork state farming community in 1776. 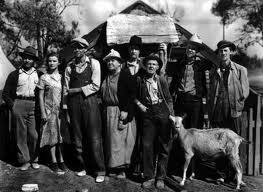 Extended family as community: the Joads in "The Graspes of Wrath". 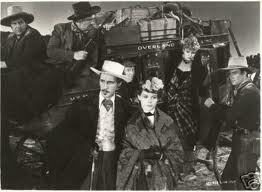 An improvided community in the form of a disparate group of stagecoach passengers. For Ford, the community is always under threat - in this case, from raiding Mohawk Indians in "Drums Along the Mohawk". Here Ford frames the Indians sao that they seem to be apocalyptic demons. 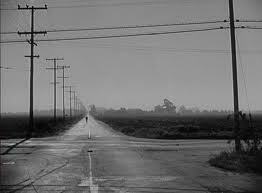 The environment can also menace the community - this opening shot from "The Grapes of Wrath" conveys a mood of iloslation and bleakness. 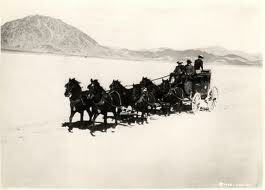 The sense of the stagecoach 'community' in peril is strengthened by the way the coach, horses and passengers appear completely exposed against the pale flat surface.